Be the first one to pick out your favorite color and style. Check all of our dresses out here! Complete your bridal look with beautiful bridesmaids! Largest Sherri Hill retailer in Florida! We have all the new trends your looking for. Helping you look your best on your special day. Welcome to Dream Gowns! We are the Gulf Coast's leading connection for Bridal and Prom Gowns. We are getting new Gowns in weekly. We have all of the top brands and latest trends are ready for your upcoming dances! Call ahead and reserve your dress before someone else does! Let us help make your special day one to remember. We feature top brands in Wedding Gowns and Bridesmaid Dresses. From Dresses down to all the accessories, we can help! 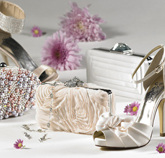 We have tons of trendy accessories to compliment all our Gowns. From handbags and jewelry to shoes and hair accents, we have you covered head to toe! Check them out! Sign up for our Newsletter and stay up-to-date with fashion! We are constantly updating our Bridal and Prom Dresses, not to mention great accessories! Sign up to stay in touch.